Tales of Phantasia was originally a Japan-exclusive RPG, but today, translated reproduction cartridges are available. Note 1: Like RPG/Adventure games? Check out my reviews of Ancient Stone Tablets, BS Legend of Zelda, and Zelda: Parallel Worlds Remodel. 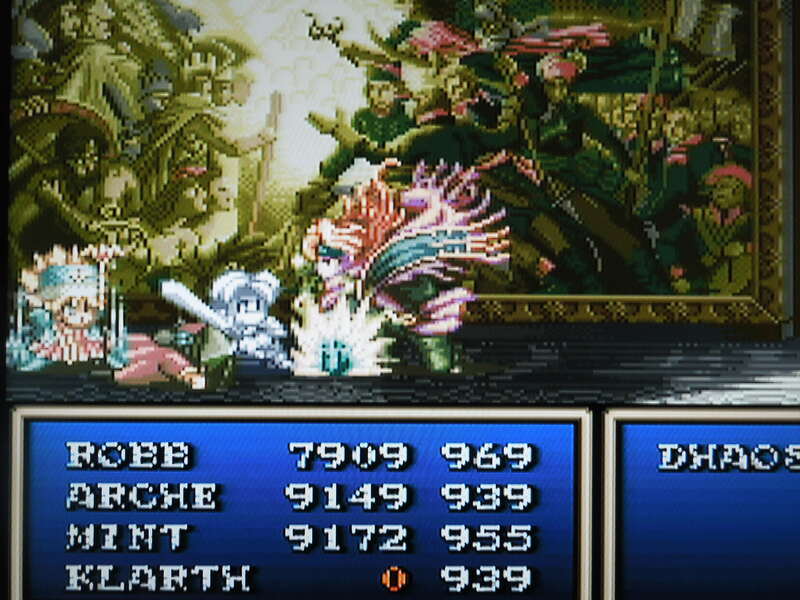 Note 2: This game was played on an original model SNES console using S-video cables. The SNES was connected to a 32-inch HD tv. Quick History: Tales of Phantasia was an RPG released for the Super Famicom (the name of the Super Nintendo in Japan) in 1995. Although there would be a Game Boy Advance version released in the U.S. in 2006, U.S. Super Nintendo owners were out of luck, as this RPG, like many others, never received a translation and release in the western hemisphere in the 1990’s. Today, however, the game has received an unofficial translation by DeJap Translations, and the rom can be placed onto a cartridge for play on a SNES. Brief Story Summation: The story is a fairly complex time travel tale, but here is a quick overview: Dhaos, a seemingly evil sorcerer, has been released from his magical imprisonment in the ‘present’ time, and five hereoes – Cless, Chester, Claus, Mint, and Arche (Mint and Arche are female) are tasked with stopping him. The group pursues Dhaos through time, battling him 100 years in the past, in the ‘present’ timeline, and 50 years in the future. In all timelines, Dhaos wages war against individual countries and kingdoms, with his true motivation not revealed until the end of the game. 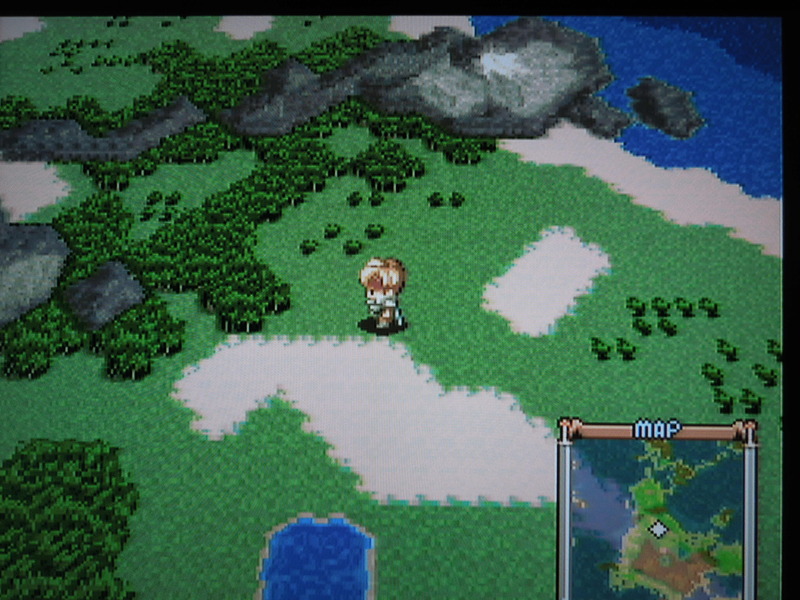 Gameplay: Despite the fact that you eventually acquire 5 members in your party, as you traverse the towns, country, and overworld map (all in a top-down perspective), only 1 character is visible. This is your ‘lead’ character. When you have major (dialogue) interactions, or when you enter battles, the other characters become visible. During the game’s 30+ hour adventure, you’ll travel among towns, castles, dungeons, ships, and the countryside battling monsters. As you progress, your characters will learn magic, obtain new weapons, and grow stronger (gain levels). Save your game anywhere on the Overworld Map. 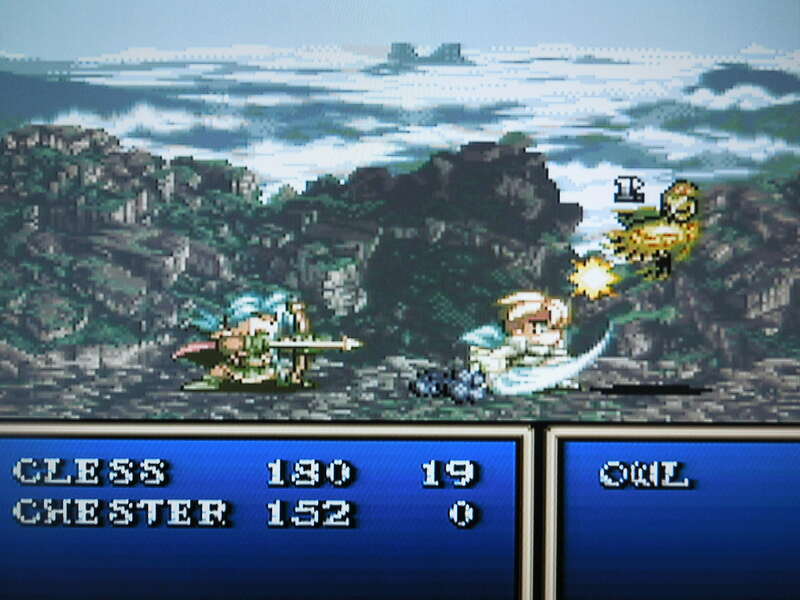 Battles: Tales of Phantasia implemented a unique battle system, which is far different from other RPGs. Battles occur randomly when your party is traveling in certain areas (mostly anywhere outside of towns). Although these battles occur frequently, you can buy Holy Water to drastically cut down on the amount of battles you’ll encounter. When you enter a battle, the game switches to the Linear Motion Battle System. 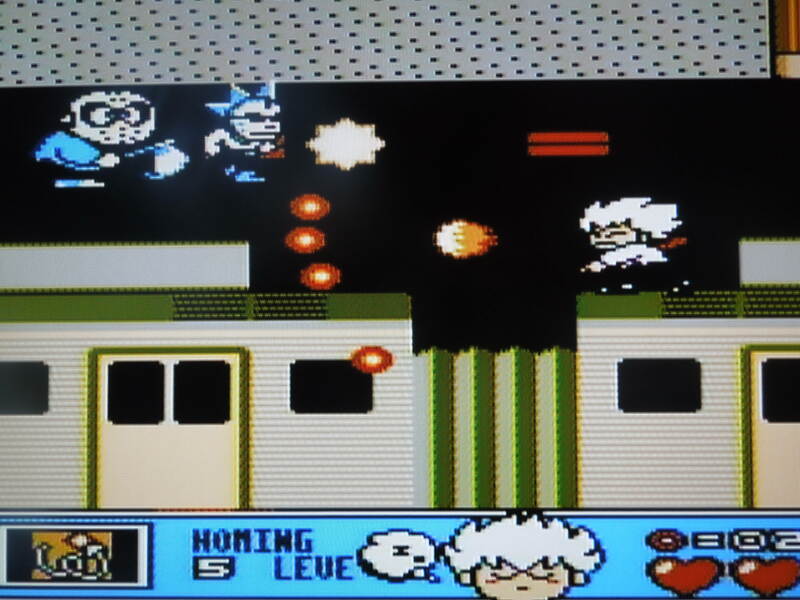 Essentially this is a 2D plane with your enemies on the right side of the screen, and 4 of your 5 party members on the left (sometimes enemies appear on both sides with your party in the middle). You can physically control Cless, moving him left and write and attacking with button A. While you cannot directly control your party members, you can give them commands, instructing them to cast spells, attack, stay away from the enemies, etc. After each battle, you’ll acquire experience points to ‘level’ up your character, making him or her stronger. You’ll also gain new fighting abilities throughout the course of the game. The Linear Motion Battle System is absolutely fantastic. Music: Absolutely amazing. The game opens with a 3-minute song called ‘The Dream Will Not End’ (that is actually sung in Japanese), and it’s beautiful. Throughout the game, sweeping scores accompany the story, superbly enhancing the gameplay. This particular game had to be made with a special chip to accommodate the extra music. There is even an option on the Start menu of the game to listen to the tracks from the game – this is a great addition. Sound Effects: There is a male Japanese voiceover at the beginning of the game, and during gameplay, English (although they can be tough to discern) and Japanese battle cries are issued from the characters – they’re nothing great, but I do think they add to the game. You will acquire 5 members of your party as the game advances – each with a dynamic personality. Difficulty: Relatively tough, but certainly not unbeatable. I played all the way through the game, and it took me just over 36 hours to beat (the game keeps track of the time you’ve spent playing). There are frequent save points in the game’s dungeons and castles, and you can save anywhere on the Overworld map. The ‘random’ battles occur constantly, however, and can be frustrating UNLESS you keep a heavy supply of Holy Water with you at all times – this makes the frequency of battles more bearable. Of course, the more you battle, the faster you’ll gain levels to strengthen your characters. 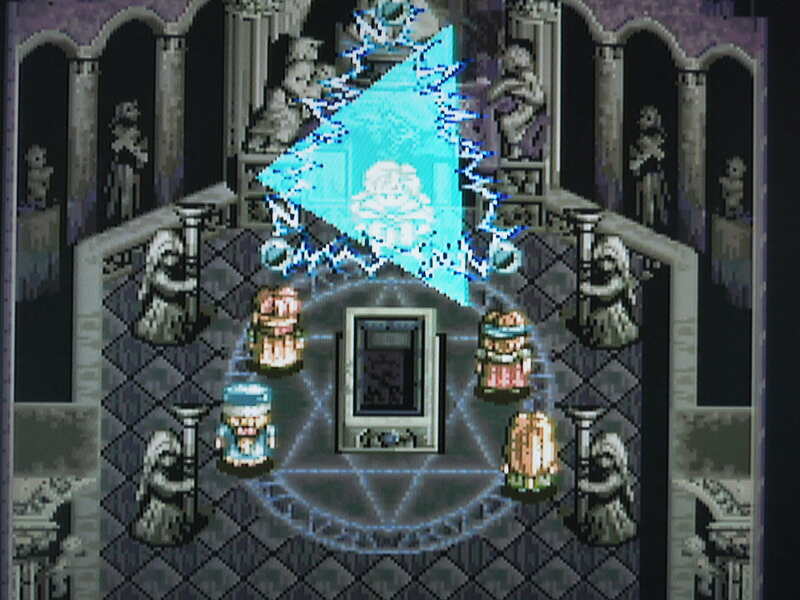 The bosses in the game’s castles and dungeons can be exceedingly tough if you’re under-prepared, so a lot of ‘level-grinding’ against weak enemies is necessary. Translation: While it’s great that there is a translation for this game, and the story is captivating, unfortunately, the translators incorporated way, way too many vulgarities and dirty jokes into their ‘translation’. The ‘F’ word appears several times, as well as many other curse words. While I have nothing against crude language in the right setting, here, it is simply not needed, and actually hurts the experience of the game. 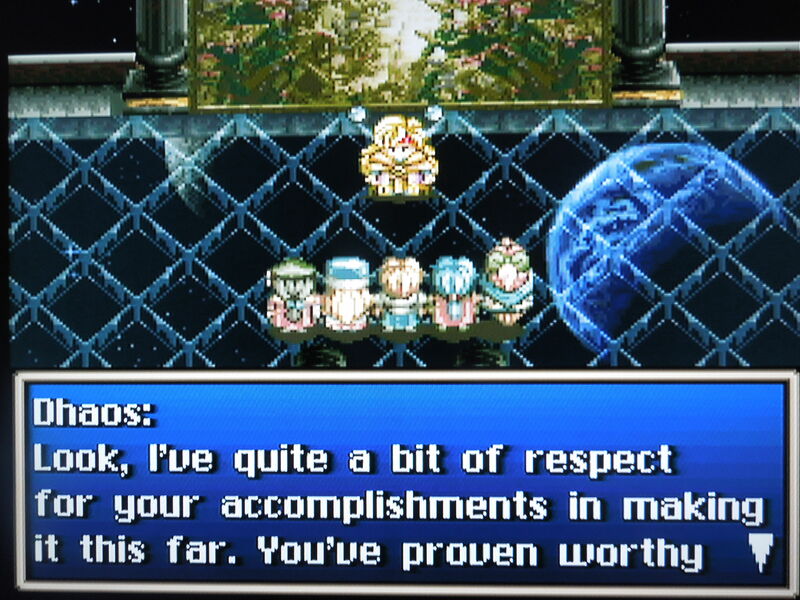 Many RPGs have moments of innuendo that cause you to chuckle and that fit well with the game’s story, but some of the dialogue in this game is so tasteless and over-the-top that you’ll wonder what the translators were thinking. If you’re playing this particular translated version, do not play it around young children. Additionally, there are other noticeable grammatical errors and typos to be found here and there. All in all, however, the translation does do a good job of explaining the story and building up the storylines of the characters. Dhaos is the game’s antagonist, and he’s not your stereotypical ‘bad guy’. So, where can I find this game? You can buy the original Super Famicom game on eBay. I’m unsure how much of that version is actually in English – most likely, none of the story is, but possibly the menus are in English. If you want to play the English translated version, several SNES reproduction websites sell the game, or can create one for you by request. 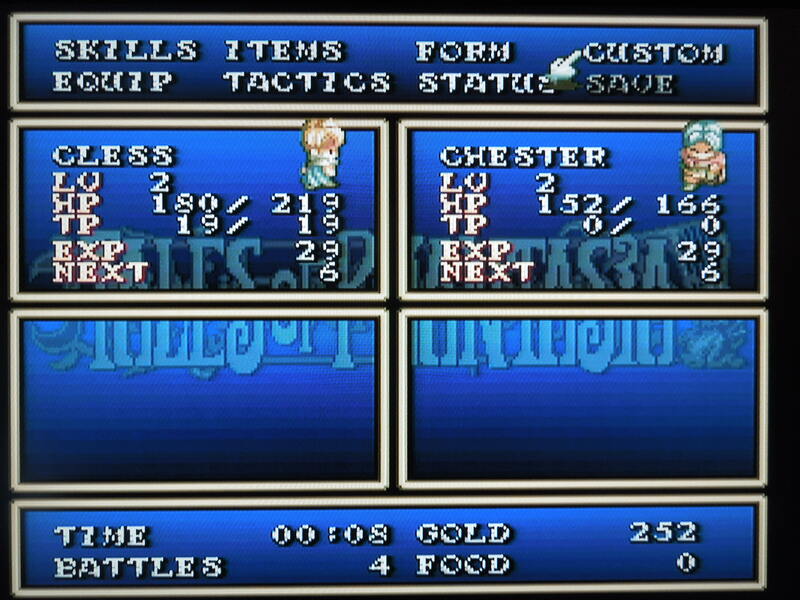 *Note – be sure to do some investigating about reproduction cartridges before you obtain Tales of Phantasia. Because the game requires some special chips in order to be made, I believe it may be a more difficult game for makers to create, and thus there could be problems with the cartridge, like what I’ve experienced with my reproduction cartridge. While my cartridge saves just fine, unfortunately, approximately 20 times during my 36-hour playthrough, the cartridge would inexplicably flash to a black screen and stop working – I would have to turn the power off, then back on to get it to work again. Why did this happen? I have no idea – sometimes it would happen after playing for 5 minutes, sometimes after 2 hours – maybe something was overheating? I’ve never experienced this with any other reproduction cartridges. The point is, simply email the reproduction maker and ask if they’ve had any problems with Tales of Phantasia – it is possible of course, that most reproduction cartridges of the game are fine, and it’s just my copy that has the issue. A good overall translation is marred by moments of out-of-place, crude dialogue. Conclusion: I was honestly a bit surprised with how good this game is. The story, which honestly can be a bit difficult to follow at times, is still fascinating, particularly as it incorporates elements of time travel. The character development and twisting plotlines are great – you genuinely care what happens to the members of your party after only a few hours of playing. While the battles occur far too often for my liking, I think the Linear Motion Battle System is fantastic – it almost has the feel of a 2D fighter like Street Fighter 2. The characters, enemies, and bosses (during battles) all look visually stunning as well. The only real problem, as I’ve mentioned, is with the translation – a good ‘PG’ version, or at least, a more tasteful adult version would have been far better than the sophomoric dialogue that sometimes occurs. 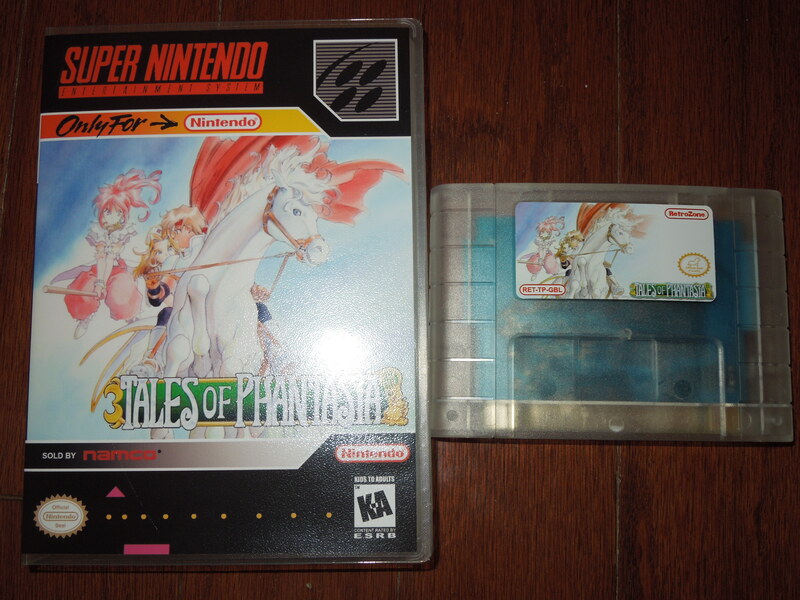 This entry was posted in SNES - Tales of Phantasia and tagged Tales of Phantasia SNES Review. Bookmark the permalink.